Public parks and private gardens across America – from Philadelphia’s Fairmount Park to Chicago’s Brookfield Zoo and Botanic Garden, from The White House to The Boston Commons – provide settings for the well-loved sculpture and fountains of Sylvia Shaw Judson. Sylvia Shaw Judson (1897-1978) was born in Lake Forest, Illinois, near Chicago. Trained at the Art Institute of Chicago and in Paris under Antonine Bourdelle, her skill and talent was recognized with an impressive list of honors, prizes, and awards. From 1917 until 1986, the Art Institute of Chicago annually awarded the Logan Prize for the work judged to be the best American painting or sculpture. 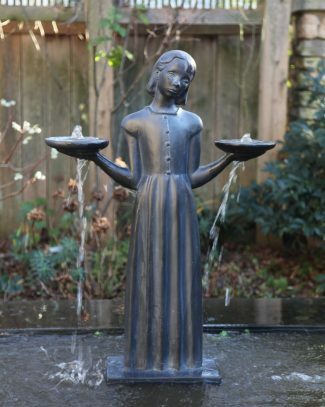 In all those 70 years, according to AIC archivists, only one woman ever received this prestigious prize for sculpture: Sylvia Shaw Judson for The Little Gardener. For the first time ever, many of her sculptures, all with the approval and permission of her estate, are available for reproduction and purchase. Potina is very honored to be the exclusive supplier of these beautiful masterpieces.